Like many pro ballplayers who played in the ’80s, catcher Tony Pena had a respectable mustache. 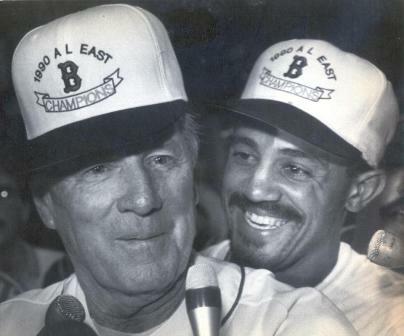 But let’s not beat around the bush – Pena makes it onto our list because any excuse is a good excuse to put up this incredible picture from the Boston Globe of Tony celebrating the 1990 AL East title with manager Joe Morgan. Pena came to Boston when he was 33 years old after spending his entire career in the National League. He was known primarily for his defense behind the plate, his game-calling and management, and (mostly) the way he would stick one leg out straight out to the side to gain leverage in his catcher’s crouch. As a Red Sox, he hit at the bottom of the lineup, where he posted some pretty ugly OPS figures ranging from 18% below league average in 1990 to 62% below average in 1993 – his last season as a semi-regular in a major league lineup. He retired in 1997 and spent four years managing some terrible Kansas City Royals teams. Since 2009, he’s been the bench coach for the Yankees, although at no point during his tenure in New York has he been in the presence of the coolness exuded by former Sox manager Joe Morgan in the picture above. 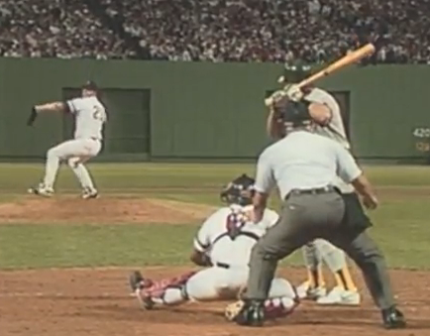 This entry was posted in Red Sox and tagged Joe Morgan, Tony Pena. Bookmark the permalink.